Trevor was once again a guest on Global’s Breakfast Television. This time for World Teachers’ Day. Once again Trevor didn’t do it alone and was joined with our grade 9 student Jonah. Together they spoke of Streetfront, Street2Peak, marathon running and our fast approaching SHLF Run on Oct. 14th. As Trevor states in the interview 100% of the proceeds goes to our little school in EastVan! (http://shlf.ca/run to register/donate/support). Here’s another profile of a fantastic Streetfront kid. Streetfront kids know heartbreak. They’ve seen it. Lived it. They come to accept it as normal. Disappointment and loss are as common a thread in their lives as anything. For my own kids, they’re disappointed and sad if we don’t get sushi for supper on a Friday. They bemoan the fact that our hotel might not have a big enough swimming pool. Typical complaints from affluent kids but pretty superficial. Nobody died. Nobody went away never to come back. They didn’t have to move because a fire destroyed everything they had. They didn’t have to leave in the middle of the night to get to a shelter for abused women. Somebody didn’t have their leg amputated due to complications from diabetes. Streetfront kids have. They’ve experienced it. They’ve lived it. Amanda Leo entered my life when she was in grade 8. I met her as a lovely, precocious kid sitting in Britannia’s office with a cast on her arm and glasses on her face. I was drawn to start a conversation and she reciprocated my interest. Soon I found out the means of the injury and how bummed she was because it was going to interfere with hockey, baseball and basketball. I knew this girl and I were going to become friends. As the conversation progressed she told me about herself and how things were going. She was a Brit Elementary kid and had two younger brothers and a baby sister. I left that initial meeting knowing we were going to cross paths. Amanda and I w ould talk every time I saw her on the hallways. She always had so much bounce to her – quick to tell me anything new – her eyes always looking for the good in the world. I knew she was struggling with her academics. Lots of issues at home took its toll. Amanda, being the oldest sibling, always took on a maternal role to her two brothers and young sister. Whether she wanted the responsibility or not, she knew she had to do her part to help keep her family together. Amanda also, like so many Streetfront kids, lost her Dad in 2006. He was everything to her and the pain she felt then has never left her. A few months later, Amanda came up and said she was thinking about attending Streetfront. I was so excited. Regardless of whether there was room – she was joining our school. She came down and met Barry and Gord. She impressed them just as she had me. A week later Amanda Leo joined Streetfront and my life has been better ever since. Amanda loved sports. Ok, let me change that – she LOVED sports. Everything about it, she liked. Physically she had all the tools. Great coordination, amazing hands and that indomitable spirit that separates good athletes from great ones. Streetfront was the perfect place for her. Within days, she assumed a leadership role in our class. She instantly showed her prowess in our PE program. I’ve been running sports tournaments for all the alternative schools in Vancouver for decades. Kids that are in alternative programs instantly know that they are on a different path than kids that go to “main” schools as we call them. Initially they feel like they had to accept a demotion due to the circumstances that brought them to us. Their pride takes a shot and their self-esteem has definitely been challenged. My job is to change that and have them understand that joining an alternative school may have been the most fortunate event to happen in their lives. That demotion in fact was a promotion to something extraordinary. Participating in tournaments is a part of that. When a tournament is held a 100 kids come together – every kid having a story attached to them – but when the whistle blows, they are just athletes, kids with a collective purpose. Their initial reticence is replaced by a fierce commitment to their team. Kid’s who would never move a muscle in a regular main school PE class are barking at me to get them in the game because they can’t stand sitting on the sidelines. We get so much buy in from the kids that for every tournament we have to split our 22 students into 2 teams (automatically reducing our talent pool by 50%). Most programs struggle to get one team. We have two teams with subs chomping at the bit to get into the game. To make things even more difficult, we are a junior alternative program, so we have almost equal numbers of grade 8, 9 and 10 kids (this year for example we have 6 grade 8’s; 9 grade 9’s and 7 grade 10’s but we compete in senior tournaments where the average age of our competitors is 17 or 18 years old. We don’t care. We want to play and the kids commit themselves so fully to the cause, we usually come out on top. Last year for example we won the softball, volleyball and indoor soccer tournaments. The volleyball championship was ridiculous – I mistakenly put 5 grade 8’s on a team of 10 players – it didn’t matter, they won despite being at times 5 years younger than the kids on the other side of the net. For those kids, that might have been the only tournament they have ever won, period. We will memorialize every win with a photo that will hang on our wall. Kids will come into the office 10 years after they graduated (like today) and I will always find their eyes gravitating towards their photo, hoping that I might tune in and regale with them on their victory. Their smile and pride as evident today as it was then. Amanda Leo couldn’t wait for these tournaments. She arrived at Streetfront a few weeks into September. The first tournament of the year is always softball held at Trout Lake in early October. We practice a number of times prior to the tournament and this year the prospects were looking pretty similar – horrible skills, no knowledge of the rules of softball and a big dose of apprehension lurking over all the kids. Amanda showed up and things definitely improved. Within 2 minutes, she was better than the whole team combined. She didn’t play a position in the infield, she played the whole infield (I’m not joking) and she played most of the outfield. She batted cleanup and also pinch ran if we had any injuries. We went into that tournament with only 5 grade 10’s – I thought we were going to get clobbered but Amanda was the difference. She scooped up every grounder and threw a rocket to first every time. She caught every pop fly. She hit home run after home run, driving in almost all of our runs. Her play became infectious. Soon other kids were raising their game to levels we hadn’t seen before. In our softball tournaments there aren’t 3 outs per inning, instead we allow 10 batters to bat each inning and tally up the runs scored. We found ourselves in the championship game. It came down to the final batter and we were up by 2 runs. They had a runner on 1st and 3rd. We had to stop the hitter from scoring. We decided to put Amanda in the outfield. Their best hitter smashed a ball to deep centre, Amanda could’ve easily made a play on it but she didn’t. Instead she allowed Jericho Cowell (a very inexperienced player) the chance to make the catch. I was yelling, “Get the ball, Amanda, make the catch!! !” She stopped her run and moved out of the way to watch Jericho, as unlikely as it seemed to be, make the game saving catch and winning us the tournament. Amanda was the MVP of the tournament – the 1st female I ever remember winning that award but I barely remember that. What I’ve never forgot, is her allowing her teammate the chance to be the hero of the game. That’s a teammate. That’s a champ. Amanda showed the same tenacity and commitment to long distance running. Back then; it was rare for our female students to participate fully in our running program. We’d get most of them to commit to the training runs, but very few were willing to push towards the longer distances. Amanda and Toni Gladstone (who I’ve profiled previously) were different than the others. They decided to commit and fight through the pain. They started to run the Deep Cove runs (20 km) and consistently ran the 10 km training runs. They knew they were as talented as the boys and were willing, on a daily basis, to prove it. By early May they were ready and when they crossed the finish line down by Plaza of Nations, they were the first Streetfront girls to run a half marathon. They changed everything. Girls now knew it was possible to run these distances. They knew they deserved as much attention and accolades as the boys did. I look at last year’s numbers and we had 26 half marathons and 12 full marathons run by the female members of our marathon program. Amanda Leo helped cr eate that narrative of possibility and hope. Amanda left our program after her grade 10 year and went to a senior alternative program called Outreach. She had made such strides in her life. She became a member of our vaunted Britannia Senior Girl’s Basketball team. She was the heart of the girl’s soccer team playing goalie. She was a provincial level bowler. She became a dedicated student, understanding that sports alone weren’t going to bring her the future she wanted. By her grade 12 year, it all came together. Her peers and teachers selected her as the Valedictorian at Vancouver’s Aboriginal Graduation. She delivered an amazing speech that touched upon the hardship she faced growing up and the dreams she had for her and her fellow graduates. I remember going up to her after her speech and thinking how proud I was to have been her teacher. Amanda left high school ready to face new challenges. She entered into the workforce immediately and quickly impressed her bosses. She found work doing kitchen installations and millwork with a high-end shop called MJ Installations (the big name downtown high-rises, that’s where she practices her trade). She’s been there for 8 years leading her crew, as dependable and talented as she was when I taught her. Being a female in such a male-dominated industry has its challenges but as always, she proved she was as talented as anyone and never let someone tell her she couldn’t do something. She still plays softball on all the top teams (Outlawz, Slow Pokes and Those Pitches), bowls at Grandview Lanes and works every summer at an amazing summer camp called Hooksum, which I’ve written about recently. I speak to her regularly and am so blessed to have her as a friend. I see her Facebook posts and they are usually filled with photos of her mom’s baking or her Dad’s memory. The pain she feels is real and it won’t go away but she knows she’s done well. She knows she’s in charge and she’ll see her way through the tangles that will undoubtedly come up. We are all proud of her and know that she represents everything we’ve ever believed in: toughness, perseverance and character. She’s as good as we have. I’d like to introduce you to Amanda Leo, a Streetfront legend. Streetfront has always tried to offer the most immersive and experiential opportunities for our students. This summer we continued this tradition by running an incredible summer school program out of the Hooksum Outdoor School in Hesquiaht Harbour, BC. We took 18 brilliant Streetfront and Britannia students to the traditional territory of the Kiniqwastakumulth Clan of the Hesquiaht First Nation. Under the guidance of Steve and Karen Charleson and leadership of Mariah Charleson, Alex Jules and Amanda Leo (more to come from her, stay tuned) our students experienced an incredible 8 day immersion in the natural, cultural and physical components of traditional life on BC’s west coast. The camp was beyond belief. 18 disparate kids all coming together to build an amazing collective. Leaders were born and challenges accomplished. 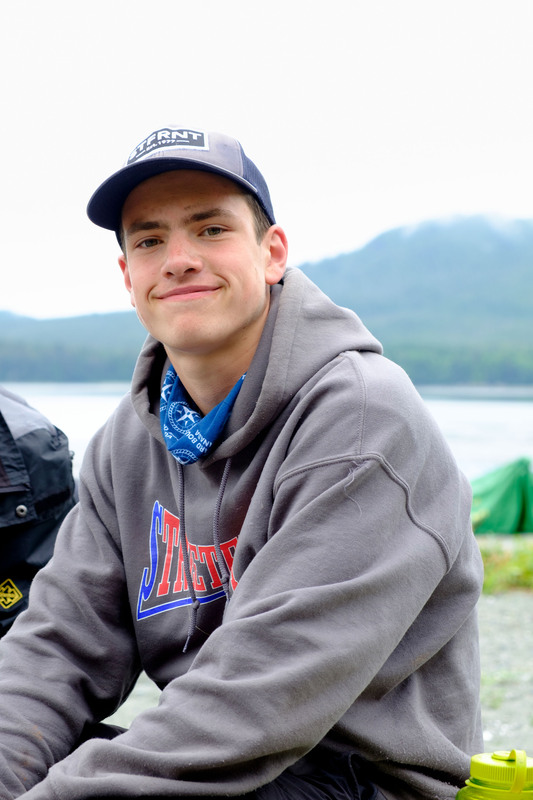 Spectacular day hikes, amazing backpacking trips, kayak journies along the fabled BC coastline, evening beach volleyball and ultimate frisbee matches and the greatest meals a hungry student could ever ask for. Look at the photos and see what contentment, pride and self-confidence looks like. It was an amazing thing to witness. We are currently in the throes of our biggest fundraising cycle. We are fundraising to take over 40 students to Seattle to run the Seattle Marathon on Sunday November 25th (the largest single gathering of high school marathoners at one race). We are also 6 months away from the 3rd installment of our Street2Peak Project. In March 2019, we will be taking 15 students to New Zealand for an amazing physical and cultural exploration. We have only been able to accomplish what we’ve done due to the incredible support of our Streetfront community. Kids that come from our community would NEVER get the chance to explore the world and their own capabilities if people didn’t believe in their efforts. I hope you see in the faces of these amazing kids the hope and beauty that I get to see everyday. If people would like to support our program (Streetfront; Street2Peak or our marathon program) – the easiest way is to donate online at www.shlf.ca (the charity where 100% of the money goes to us) or to register for our annual charity run at https://2mev.com/#!/events/strachan-hartley-legacy-run-2018. Don’t forget that early run entrants get the coziest, comfiest, most wicked run shirt ever and a Ron Suzuki led PANCAKE BREAKFAST at the end of your run. I’ve written these student profiles before in the hopes of giving people an insight into the kids I work with and the work we do at Streetfront. Kids, 5 and 10 km runs. 100% of the proceeds go to Streetfront and the initiatives we run (our outdoor education based alternative program; our internationally recognized marathon program and our Street2Peak Project which is the largest field study project in Canadian history). I hope you find these pieces hopeful and positive. Seems like we could all use a bit of that in our lives. Wilson struggled initially with the physical demands of our program. We play a basketball game called bump at the start of every class. It’s a fun, interactive way to start each class but it’s competitive. Wilson’s basketball skills were pretty low and routinely he was quickly eliminated from the game. Same thing with volleyball – he couldn’t resist the impulse to punch the ball rather than safely play that ball with the appropriate technique. All of this was visible, it was public. He knew where he was physically, compared to the other kids. As a new kid in a program, you have to work through this and gain the skills necessary to compete with your peers. If you give in to the embarrassment you never pass that “newbie” stage – you never get to a position of confidence and pride. Wilson was really finding it hard to find the humility needed to improve. From that point on, there was a discernable shift in how Wilson operated at Streetfront. Though he still had a definable edge to him, he was far more willing to talk the staff, to the other kids to allow us a chance to get to know the kid under that edifice of anger. Once he had completed his first 10 km, he was hooked. He was not going to let himself be defeated by the distance. It was going to be brutal but he committed to run a 10 km every single time we went out. He also committed to running the Vancouver Half Marathon in early May. This was a really big step – publicly stating that you are going to run Vancouver means a lot in our school. It means you’ve stepped up and are now willing to put your name on the line. Very few, if any, have ever not fulfilled their intention. Unless you are ready to hurt and fight, you keep your mouth shut. Wilson stood up and told everyone he was going to do this. On May 6th, he completed his first half marathon. A brighter future was unfolding. If anyone would like to donate to our program, you can do so at the following. Willy DuGray entered Streetfront about as quietly as someone could. Dressed entirely in black, with his hoodie all the way up. His face was a shadow. He was hunched over and didn’t utter a sound when I first met him. I knew his family, having taught his cousin 3 years earlier. His mom was desperate to find something that would awaken her son. He was becoming a shadow himself – an outline of her former son. He was 13 years old. It was a strange application process, since Willy contributed absolutely nothing to the interview. His lack of words, body language (literally melting into the table to avoid any human interaction) and palpable anxiety told us this was one troubled youth. His mom talked of how he used to be a precocious and garrulous youngster. How he used to be filled with energy and vitality. A kid who loved to play basketball. We had no reason to doubt her but what we saw in front of us, couldn’t have been more to the contrary. To make things stranger, were the physical demands Streetfront asks of their student’s. We start everyday with an intense, high cardio PE class; we run three 5-10 km runs per week; we go on 30+ outdoor exclusions and 3 camping trips per school year; most of our breaks are out on the field throwing the Frisbee. How was this kid going to make it? Couldn’t have seemed like a worse fit. Willy came to Streetfront the next day and went straight to his assigned desk and put his head down. He stayed there till we told him we had PE. Reluctantly, he got up and followed us to the gym. Promptly sat down and put his head down between his knees. He stayed that way for the entire hour. Once that was done, he returned to class and buried himself inside his hoodie with his head on the desk. He didn’t utter a word or sound. He ignored everything. We tried to introduce him to his new classmates but that was less than successful. This continued for 2 MONTHS!!!!!!! This was not easy for me. I’m a pretty high-energy teacher, some might say, hyper. I feed off the energy of the kids. Willy was killing me. He didn’t fall for my ploys. He ignored my tangents. He was immune to any charms I thought I possessed. I was getting nervous. What was I going to do with this kid? One day I was teaching chemistry. I was walking around the classroom talking about protons and their matching electrons. At certain times pairs of electrons are shared, these are called covalent bonds. I had just started teaching this subject and posed a question that I assumed most wouldn’t know but would segue into the next lesson. As I walked back to my desk, I passed Willy. He was in the same exact position, he always was except beside his head, written in large letters was COVALENT BOND. He hadn’t been asleep. He was actually listening. There was life!!!! Now as I taught, I recognized the nascent intelligence inside of Willy. He started to put a few answers down on his lesson reviews. He would complete most of the class notes. He still wouldn’t talk or take his head out of his hoodie, but we were making progress. PE and the runs were still an issue. We would ask him to play and reluctantly, he started to oblige. Soccer seemed to interest him the most. We played a lot of soccer. He liked defense, so he was always on my team and we were D partners. He wasn’t really playing, more like getting in the way, but we were ok with that. He would walk the runs to start. That was a violation of Streetfront rules but we had to bend a bit. After a month or so, the walk turned into a shuffle, which morphed to a lope and finally a run was before us. He was still draped in black, with jeans, hoodie and skin that hadn’t seen the sun for years but he was doing it. By the end of his grade 8 year, Willy began to speak. He started to mumble answers in our academic classes. He really liked science and it became evident he knew what he was now starting to talk about. Whenever I asked the class for an answer, Willy would pause, never wanting to speak over anyone, and then when nobody else had the answer, give me the correct answer. Eventually, I had to implement the Willy Rule – Willy could only answer the questions I posed to him. If I didn’t, Willy would answer every question. I’m not lying. Every question. Willy’s grades started to rise and as we’ve seen with so many of our students, he started to apply himself to all aspects of our program (except writing essays – that’s another story but you’ll be happy to know that he has conquered that too. See the end). Soon he was enthusiastic about our PE program, he was jumping off cliffs in his snowshoes, and he was making friends. His mom was getting her boy back. He slowly broke through as a runner, as well. He threw up a lot in those first few 10’s but he persevered. The transformation was becoming ridiculous. By the end of his grade 10 year, if the weather was apt, he would run without his shirt on, hopping over any obstacle in his path. He eventually got up the courage to run his first half marathon. Then came his second and then his first full. Willy has went on to run 11 half marathons and 4 fulls, most of these with zero training. Like so many of our former students, they have mastered the mental aspect of long distance running. Willy will be running the in the Vancouver Marathon this May alongside all the other kids, like the fixture he’s become. I have two memories that still make me smile about Willy. The first was when I received a letter from his brother, saying how proud he was of Willy and Streetfront’s role in that success. He, like Willy, had faced incredible adversity in his life. As a young man Willy watched as his family fell apart. He calls his own life as ghetto as they come. His sister nearly died when she fell from the 3rd floor, headfirst into the alley outside of Willy’s apartment. Willy was 6. His brother, a career criminal from the age of 8 (ask Willy), eventually committed a major crime as a 14 year old and was sent to a juvenile detention centre until he turned 19 and then was sent to Kent Maximum Security Prison. Willy was 7. Willy didn’t talk much about his family but I learned a few things about his brother. While in prison, he honed his art skills becoming a renowned prison tattoo artist. He got his high school diploma. He even was accepted into a stained glass program, a rare thing for certain level inmates. In his letter, he mentioned that he had something for the program and he wanted Willy to give it to me. I had no idea what this gift was but I returned a letter to him, saying I’d be honoured to receive such a gift. 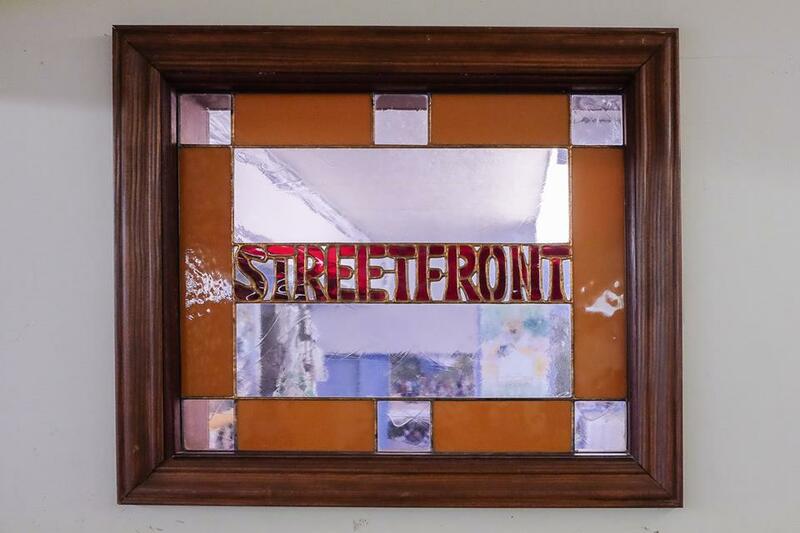 A few weeks later Willy walked in with the greatest gift I’ve ever received – a wonderfully crafted stained glass window with the word STREETFRONT written across it. I got Barry and Gord to get the sawzall out and within a few hours, they had cut a perfect rectangle above the door to our office and inserted the stained glass window. The most beautiful transom you have ever seen is still there, just waiting for someone to ask me where it came from. The second memory to some wouldn’t warrant much attention but to me it meant the world. I love books, maybe too much if you ask Pauline but I think it’s not the worst vice to have. I am always yapping to my students about books and movies – art, basically, hoping that one-day, they would find in books, what I found; a constant friend and companion that always teach you something. Willy came back to Streetfront the fall of his grade 11 year to visit. He quickly started telling me something that I had waited years to hear. He told me he had read Fahrenheit 451, Ray Bradbury’s classic commentary on what might be in store in a McCarthy dominated USA. He was so excited to talk about the censorship issues and the larger political themes. I added a bit but basically just let him roll. I was so happy for Willy. He found it. He found the beauty in learning. He wanted to engage with those pages, not because he had to but because he wanted to. He wanted to know more. Willy went on to become an integral part of the Streetfront family. He graduated high school at the top of his class; became a senior mentor with the Yo’ Bro Youth Initiative (an amazing non-profit that works to give kids a chance to reconnect with everything positive in life); became a manager at a recycling depot and was getting an A+ in his essay writing course (I told you, he’d conquer that). He continued his connection to Streetfront, showing up in the mornings for our PE classes and always coming back when I needed him to. Willy will be travelling to Taiwan this summer with his girlfriend. 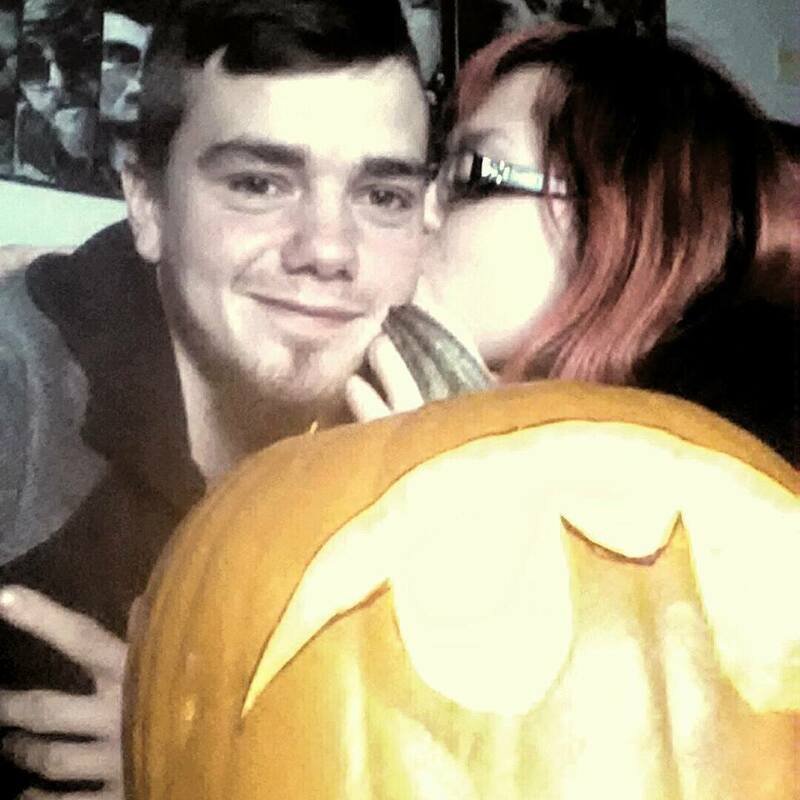 When he gets back, he’ll start classes at Kwantlen Polytechnic University. Who knows, maybe you’ll be sitting beside him in class? He’ll be easy to find. He’ll be sitting up taller than anyone else in that classroom. I’d like to introduce you to Willy Valour DuGray. People think they have it tough. I hear it everyday, how hard their life is. Raymond King has never had it easy. NEVER. Believe me on this one. However bad things might seem, take solace that you didn’t face the struggles and obstacles this young man has encountered since birth. He definitely struggled in school but the teacher’s were absolutely correct about one thing – the kid had the goods. He just didn’t operate the way they needed him to. His high school career careened off course pretty quickly. He was asked to leave his high school towards the end of grade 8. He joined an alternative program and found some stability but was still way, way off course. He entered Streetfront in September of 2010, very skeptical of what we were going to offer him. The first few weeks weren’t super positive. Ray showed up and participated but his heart wasn’t really in it. He had an aloofness and air of superiority that I was unsure how to tackle. His passive aggressive tendencies were well-earned, I knew that after reading his file but I couldn’t earn his respect. It was getting towards late November and I decided to take a different tack. He had become a very consistent runner with the program, knocking off 10 km after 10 km but he always ran with a friend from his former high school. I was always at the back, picking up any kids who were struggling. I decided one day to go out with the two of them and see if I could take a bit of that smugness off of his face. The run started out slowly and then the pace quickened and quickened. By the 3 km mark they knew what was up. There were no conversations on this run. At every stop light, we kept our eyes on the flashing figure and when it was time to go, we were off. To this day, I have never ran so hard. I’m not sure if they knew but I was breaking down. The last km is a downhill push towards Britannia Secondary and I put everything I had into it. When we pulled up to the portable, I looked over and knew they were dying too. We didn’t say anything. I shook their hand, like I do to every kid who has ever run a 10 during a training run, but remained silent. They knew what transpired. I hoped I had broken through. The next few weeks were incredible. Ray started to pushing himself more in his academics. He went to Seattle with us and crushed his first full marathon. He started to be a better teammate in PE. He was becoming one of us. He started talking more, not to just us but to his classmates. The sneer and disdain that he once so proudly showed, was being replaced with a welcoming and playful disposition. As the year progressed, Ray turned into the leader of our school. He led in the classroom, led on our outdoor trips, led in our tournaments and led in his commitment to our school. He left us after his grade 10 year and returned to the high school that kicked him out in grade 8. I told him to walk back into that school and show them what he had accomplished, not in an “f-you”, kind of way but rather in a “… I’m not the kid you used to know” kind of way. And that he did. He went back and made the honour roll. He went back and starred on the basketball team. He went back and proved to all the doubters and hopefully to one nasty VP, that kids can change if given the support and challenged in the right way. Ray went on to Langara and then transferred to Simon Fraser University. He is in the fourth year of his Criminology Degree. He is preparing to write the L.S.A.T., which he will write in the spring. We will be there when he crosses the stage to get his degree, along with his amazing grandfather, David Webb, who has supported and cared for Ray for most of his life. We will be there when Ray passes the Bar. We will always be there for Ray because since he left in grade 10, he has never forgot us. He has run every single marathon we’ve participated in since 2010 and every half marathon. That’s 14 fulls and 6 halfs. He has been the big brother to a hundred or more Streetfront kids who grew up in the same world that he came from. I have NEVER heard Raymond King complain about anything. Nothing. He puts his head down and does the work. That’s what a man does. That’s Raymond King. If you are interested in other Streetftont stories or would like to donate to our Street2Peak Project (the largest Canadian field study project in Canadian history) please follow the links below. Please meet Frank Joseph. Frankie came to Streetfront after a rough start to his high school life. Always precocious and opinionated, he struggled to find acceptance in his grade 8 year. It was “suggested” that he find a new school. Streetfront became his new school. Frankie quickly ingratiated himself to the Streetfront staff. A natural athlete, Frankie always felt most comfortable be it l dropping into Hastings skate bowl as a 9 year old or working at his crossovers on the blacktop. He quickly latched onto the physical components of our program. Within days, Frankie was running three 10 km runs each week. By the end of November of his 1st year at Streetfront, he successfully ran the Seattle full marathon as a 13 year old. The troubles and conflicts that had dominated his school life were slowly fading into the background – what was emerging was the talent and confidence that was lying in trust inside that growing body. Frankie was always a risk taker but they were the wrong kind of risks. What he wasn’t initially prepared to do was commit to his education. I’ve always believed that once we “got” the kid hooked, we could leverage the physical and psychological gains we’ve made and translate that into taking more risks academically. Frankie took on that challenge. By the end of his grade 10 year, he was our top student. He was flourishing. He decided to enter Britannia Secondary for the remainder of his high school career. The teachers quickly found the same amazing kid we had got to know over the past two years. 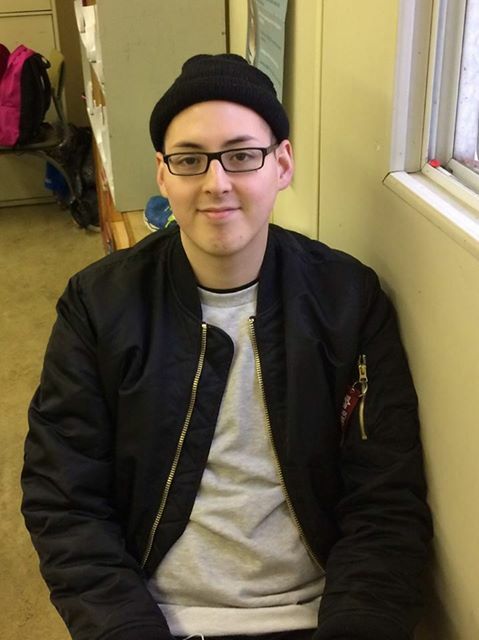 Frankie continued his connection to Streetfront as a peer tutor and mentor to our younger students. He took considerable interest in our younger Aboriginal boys, who he could see so much of himself in them. He joined the fabled Senior Boy’s basketball team; was selected to participate in the Honourable Paul Martin Initiative, which was an incredible entrepreneurial business program designed for a select cadre of Aboriginal students; participated in building homes for destitute families in Mexico; worked tirelessly to support his family; attended Aboriginal Rediscovery Camps in the summers; you name it, Frankie was involved. Frankie graduated from High School and wanted to give back even more. He raised funds to attend a leadership/fellowship program in Oliver, BC. This culminated with him doing extensive outreach work in the slums of India. 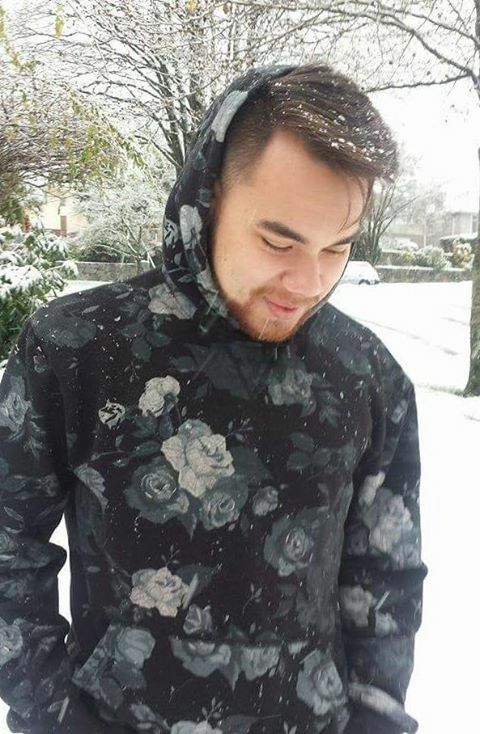 Once Frankie returned to Canada, he made the decision to enter UBC and start his Education degree. He is currently in his second year and is quickly becoming a star in his program. Like Jesse Costucci-Phillips, his goal is to become an alternative education teacher. Frankie has never backed down from a challenge. He thrives when things get tough. We’ve witnessed him become the distinguished and accomplished young man that he is today. Oh yeah, he’s 20 years old and has already run 13 full marathons and 4 half marathons. I’d like to introduce you to Frank Joseph, an all-star if there ever was one. We added a calendar page!